C.W. Comstock’s life as a writer has been mediocre at best. He’s had just enough success to survive and raise a small family. And it didn't take long after a drunk driver kills his wife for his two children to leave. With no friends and his family long gone, he wallows in his own self-absorbed pity, waiting for the inspiration to write his ultimate story. Then a surprising visit from the alluring Juanita Justus changes his life. Juanita offers him the instruments that could mean a new beginning. These instruments not only have the power to change his life, they have the power to change the lives of everyone in the universe. At first he uses his newly found powers to travel to distant locations, chronicle his travels, and become more successful than he could ever have imagined. Even so, his inner quest for the ultimate story still went unanswered. Unfortunately, the instruments come with responsibilities dictated by the persuasive U.O.H., a peculiar group of beings that command Juanita and now him. He must use his new instruments to do their bidding or suffer the deadly consequences. His assignment from the U.O.H. is to stop the maniacal Sanduval Mule. A shape shifting rouge writer, inventor, and ex U.O.H. member with plans to alter the future of all societies in the universe. He strategically transforms himself into influential beings so he can modify the historical records of inhabited planets. His modifications will transform the culture and behavior of a society and thus the planet's future. In the process C.W. meets Vienna Pitts, a beautiful, mild mannered woman who learns to draw from her inner strengths. Together they risk their lives restore truth while fighting against Sanduval Mule's deadly powers and cunning manipulation of time and historical knowledge. 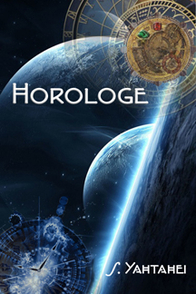 How can I buy Horologe?